Here's a little montage of shots from the march itself, which went on from 11 am until after I left around 3-ish. I'm telling you there were people pouring in from every street connected to Market and people pouring up out of the Bart Stations for hours on end. It was bad craziness at its finest. And what a happy peaceful and well-behaved crowd. Most of the cops were sitting down or standing around staying out of the way unless people came up to them to ask questions. It seemed like they were around to make the store owners feel better more than anything else -- because there were so many people. Anyway, you get the message. Check it out for yourself. Here's video footage of the unprecedented crowd of peaceful protesters. I was able to score a press badge on the fly and get up on stage to get this. I wanted to get this footage out as soon as possible in the hopes of getting the truth out before the facts become completely distorted by the commercial media. Perhaps you haven't seen my movies from Camping Out In Front Of Eldred yet. And yes, I am still pretty upset about the whole thing. But we gave it our best shot, right? And because of this, I know that I will feel just a little bit better when I'm explaining to the children of the future about what happened because I'll be able to tell them truthfully that we didn't go down without a fight. It will be just like when I'm trying to explain to them about a world that used to exist before the soon-to-be-state-of-perpetual War. It will feel better than if I had done nothing and had to explain how we all just rolled over and let our country be stolen away from us from a man who was never elected. I will be able to say proudly that we fought very hard to stop it from happening -- and I think it will feel better. Then. I don't feel so good now though -- about either situation. Our country is about justice and a legal system. And we have to insist on that legal system. And when U.S. citizens can be incarcerated, indefinitely, on the mere allegation given in secret by somebody we don't know, that they may be a terrorist -- and stripped of their rights to ever have a court hearing where they say "I'm innocent. This is wrong!" Then our country is falling apart. And what we need to do is say: "Stop! Enough is enough!" I still have a lot of content to add to it, but all of the links should be good and there's a fair amount of stuff up there now. Almost everything is available in both low resolution/small file sizes and high resolution/large file sizes. Sorry these took so long. Here are some medium and low resolution versions of Lawrence Lessig's December 16, 2002 presentation in San Francisco at the Creative Commons Launch. Here is DJ Spooky's presentation at the Creative Commons Launch last Monday night. I'll be releasing an MP3 of the music too (from the Birth of a Nation Remix). -- And yes, Paul Miller (DJ Spooky) gave me his permission to redistribute all of this stuff into the public domain, so no worries there! So remember - don't try to play these in your browser -- right click (pd) or click and hold (mac) to download these files to your hard drive and play them from there. 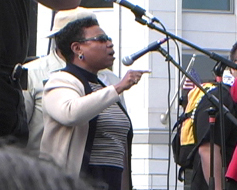 I finally finished transcribing the speeches and organizing my video footage from Nancy Pelosi's Celebration Party on November 23, 2002 in San Francisco, California. I say to people "you can take any issue or you can take any day of the week, and there is a case to be made against the Republicans." But let's just take yesterday. Yesterday, Congress adjourned without passing unemployment benefits for Americas workers -- who worked hard, played by the rules, lost their jobs through no fault of their own but because of the downturn in the economy. On December 28, 800,000 hard working Americans will no longer have their benefits because the Republicans refused to pass that. There was even a compromise from the Senate, which we still controlled up until yesterday, that said: 'Let's extend the benefits until February at least to give people a chance past the holidays and the rest.' They absolutely refused. The Democrats said 'We're going to hold up the adjournment of Congress so that we cannot leave until you pass these benefits.' They said 'you can bring the Congress back here every single day from now on. We're never going to pass those benefits.' That's who the Republicans in Congress are...insensitive to the concerns of working families in America." 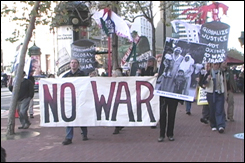 I've uploaded my video footage from the Anti-war in Iraq/Anti-Feinstein protest in San Francisco Monday, November 18, 2002. 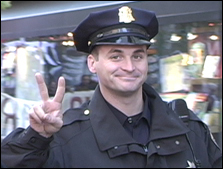 As always with my news video footage, everything is Dedicated to the Public Domain. I'm working on a better interface and a comprehensive index so folks won't get lost in the quagmire of my rapidly-expanding library of video footage. I'll also have some technical notes up soon to help explain how to install the software required to get the movies to run on various platforms for you non-uber techie folks. I also still need to re-encode everything as MPEGs capable of running on unix-based operating systems. 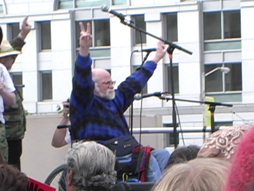 I've loaded up some movies and pictures from the march on Saturday, including quicktime videos of Barbara Lee and Ron Kovic's speeches.